Soul's Fire Designs: It's Bead Soup Time!!! I have to say, I wasn't certain if I was going to be able to pull everything together in time for this one! I was not counting on my entire family (including yours truly lol) being sick off and on for over two weeks! But, somehow, I did it! :) I didn't quite use up all of the incredible bead soup my sweet partner Kari Carrigan of Wee Gems and Charmed Pennies sent me, which you can view HERE, but I made a good effort! And things are still swirling about in my head what to do with the last bits! My biggest challenge this time around was... which focal to start with?? Kari was so incredibly generous and I had so many possibilities that it was hard to choose where to begin! But after sleeping on it one night, I woke up the next morning with an idea... I pulled out the sweet little acorn that she had made and stared at it. Then I began pulling things from my stash, faceted pale blue jade, czech crystals, stainless steel chain... and finally Marsha Neal Studio silks. Here is what I came up with and I personally LOVE it, I have already worn it a few times (I couldn't resist). And came up with this :) Simple but a bit sparkly, elegant, I think it will be perfect for an evening out! Then it took me time to decide what to do with those gorgeous Charmed Pennies she sent me... Of course the logical thing to do was make necklaces, right? But no, I had done two already.. and this was supposed to be a challenge... hmm... then one day it hit me... 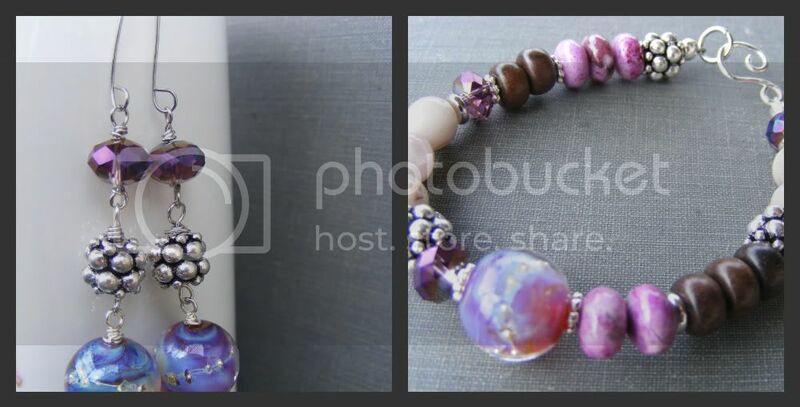 I remembered seeing the wonderful Rebecca Anderson of Songbead had done really cool little bangles! Now hmm, I didn't have pre-made bangles... but I did have some fabulous 14g Fallen Angel Brass wire. I'm one of those, if I don't have it I will try to find a way to make it myself girls these days! I also didn't have a bracelet mandrel which presented another problem, so the first try (the red one) I simply made to fit my own (rather small) wrist by simply bending and shaping the wire around my wrist. After I finished I thought, hm, well, that's alright... but I bet I could find a better way... and I stared at that coil of 14g wire for a while and then it hit me! The wire was already coiled to the perfect bangle size! I tried to fit my hand through a loop and it was no problem! I was giddy! So, I quickly whipped up two more bangles for the last two pendants and was pleased as punch! And the last that I have to show you I made with the incredible lampwork beads Kari gave me, they are so very beautiful!!! Thank you so so much, Lori, for making this blog hop possible, for having this amazing idea.. and for bringing us all together as a creative community!! You ROCK! Wow, you really went to town with all of the beautiful work. I've been using some silk pieces in mine too! I'll be back. I did go to town! LOL It was so much fun!!! I can't wait to see your pieces! Silk is one of my favorite things ever! Beautiful pieces...the bangles are my favourites! Beautiful! I like the bangles, too. Very inventive! I'm another partecipant from Italy, I'm trying to visit all of you. Thank you so much, Jo! It's wonderful to connect with someone so far away! It was so much fun! My very favorite is the lamp work bracelet. I love the beads and colors. Such pretty bracelets, Love them all. Lovely! I love the acorn necklace! :D Thanks, Heidi! The I <3 Chocolate focal is so very true ;) And I agree, the acorn is so sweet!! I love it! Everything is beautiful. I especially love the collection of bracelets-so much fun! The fibers add a wonderful texture to them. Happy belated birthday to your son! So I was trying to decide what I like best, but I keep changing my mind. I adore both necklaces. Of course the J is perfect for me and purple is one of my fave colors, but I adore that acorn and love how you added the gems and the ribbon. The bangles are so fun! The lampwork you got to use in those designs is just so juicy and yummy. Great job! LOL! That is about how I feel about it too, Jennifer, can't truly decide my favorite, I love them all! :D Thank you so much!!! My fav is the earrings. You had quite a mix of beads there and used them in some very inventive ways. Great job! It doesn't look like a sick family slowed you down at all. I wouldn't hesitate to wear any of those pieces, but those bangles are totally my favorite. They are so different and unique. . .super cool. Excellent work on all of it!! Thank you so much, Sarah! I love that acorn!! All of your pieces are very pretty. You did a great job with the soup mix Kari sent to you. I have so many leftovers from natural fabrics....will try to use them now. Thank you for an inspiration!!!! Really? I inspired you?? Oh that makes my day!! You have to let me know when you do, I'd love to see!! LOL! You totally should, bangles are so much fun! Awww, thank you so much!! That is so kind of you! Love the bangles, I so need to get the using fiber thing down, you make it look good! Aww, thank you so much, Jean! I love love love fiber! Jennifer - I love what you did! I can't decide what is my favorite! I have always just added my acorns to a simple chain, I love how you designed your necklace, and the bangles are great! It has been a blast being your partner for this hop! They're all great. I love that acorn pendant. I couldn't have resisted wearing it right away either! Yay, Kary! I'm glad to hear I am not the only one who couldn't resist it ;). Thank you so much!! Oh ugh, I'm so sorry you've been sick! Doesn't that always happen at the worst time? I love what you made, and hope you had fun! No kidding! I swear the sickness plans to invade when we are too busy! Thank you so much, I had SO much fun! I love love this! I am hoping to be able to do the next one too!! The first necklace is just stunning....but then I saw the bangles and I was awestruck! LOVE THEM! Usually, it's hard to be creative when you/the family is sick...but that obviously did not affect your creativity! You did such a beautiful job! Awww, thank you so much Patti!! I am totally excited about the bangles and have plans to make some for my shop! It is hard to be creative when everyone is sick LOL, I couldn't remember what I was doing half the time! Thank you thank you!! Beautiful, my dear, as always. Next time I visit, I'd like to see them in person! See this! I finally figured out how to leave a comment! I hope you (and the family) are on the mend! I adore the acorn...the color is crazy cool! Your bangles are pretty dog gone great too! Thank you so much, Wendy!! You made some beautiful things, and all in the midst of a sick family! 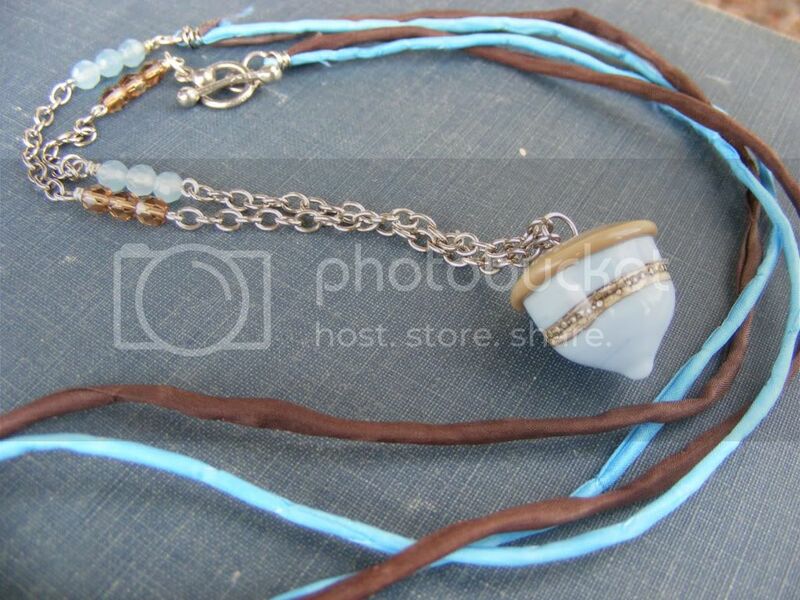 I love the first necklace, the brown and blue together are really nice! Great job! All of your pieces are so pretty. I really like all of them. I like how you use alot of fiber. Those are great Jennifer! I just love the bangles :) Great job! I love how you incorporated fabric in your designs. I really need to try this more often, my few few attempts where horror stories!! I'm in awe! Thank you so much, Kat!! Don't ever call them horror stories, ;), call them learning experiences! I totally recommend continuing to play with fabric! It is so much fun once you get into your own groove! Luv ur blog & design name! Ok I'm ur newest follower! Ur designs ur so Afreakinamazing I luv the Acorn necklace, ok who wouldn't! And the additional necklace is a beauty! The bracelets just send me over the edge! U way rock! Aww, thank you so much, Shanti! You are so very sweet! I look forward to getting to know you better through our blogs! Oh my goodness you made up some delicious soup. I love the simplicity of the acorn necklace and that lampwork bracelet is swoonworthy! Those came out great! Love that acorn focal! Thank you! Isn't the focal wonderful? Kari is so talented! That acorn necklace is such a wonderfully charming design. The bracelet wraps are funky fun! Beautiful work, Miss Jennifer!!!! I love those bangles!! ;) I guess great minds think a like! LOL!! I love making them, don't you!! Thank you so much, Sally!! LOL great minds definitely think alike! I had SO much fun making them!!! Very beautiful work, those bangles are divine. Really wonderful job on your soup!! I found some inspiration. Awww, thank you so much Penny! It makes me so happy to have given a little inspiration!! Sabine lol! It is a fantastic color! Oh I love the first necklace! I like the combination of browns and blues very much, and this necklace seems to be something I would wear very often! But also the bangles track my taste - to wear two or all three and to jingle a little bit with them must be great! Thank you so much! The bangles are so much fun!! Love those bracelets and the first necklace! Great job with your soup! Love those bangles!!! So cool and so is that acorn on the silk. 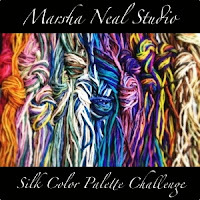 I adore Marsha Neal's silks!!! Thank you so much, Stacey! I love her silks too!! Love the 'regency' necklace. And what a smart idea to use the charm pennies in the bangles! I love the lampwork earrings and bracelet; I'm a sucker for lampwork and I love what you've done. Cheers! Isn't it funny how an idea can appear at any time? I love all the pieces you made, but my favorite are the sweet and colorful bangles. I've never been able to make these look right for some reason. Love the silk you used in these pieces. It is funny! Thank you so much, I loved making the bangles, I just finished making a couple more so I can put these up in my shop in sets of two! My first try was not so right ;) I just got lucky I swear it! Thank you so much, Alice! Glad you were able to pull everything together -All your creations came out great! Love those bangles!! Love what you did with your soup. That acorn is adorable and I really like the wrapped bangles. Great job! Enter me into your drawing. Oh Molly, I was so blessed in my soup! Kari sent me so many wonderful pieces to play with! Thank you so much!! Straggling in and I'm so glad I did! Your pieces are sweet! 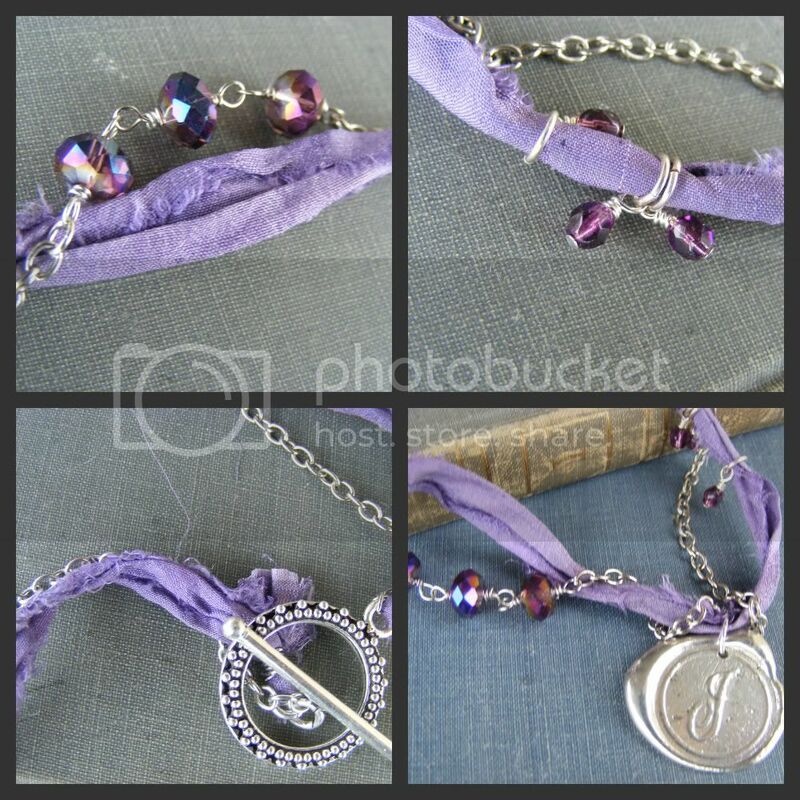 I love the purple with the J pendant and the penny charm bracelets were really really clever! Love them! I am straggling myself LOL I swear I will finish hopping this week, I am so slow this time around! Thank you so much for your sweet comment!! ((HUGS)) Thank you so much, Lola, you are always so wonderful and sweet!! <3 you!! Everything is nicely done. Love the bangle charm bracelets. But my fav is the last set. Bracelet and earrings. So pretty. Lovely jewellery! Lovely colour palettes and designs. My faves are the bangles -- really like the mix of fabric and metal. Fab job! 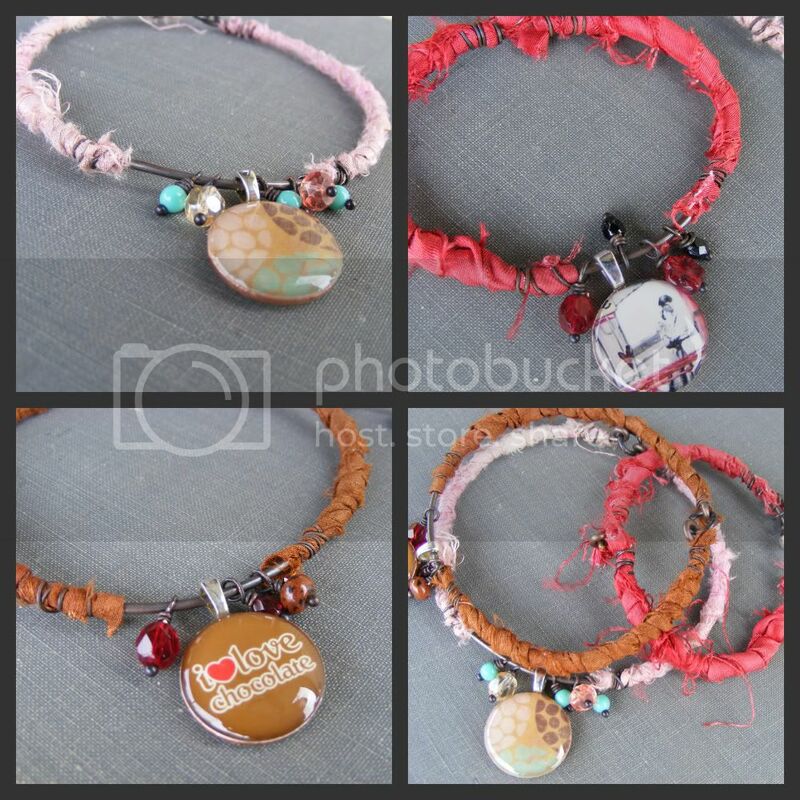 Your pieces are so much fun, Jennifer - and the bangles are lovely; I like how you wrapped them! Aww, thank you so so much Alicia!! You are so kind! Great job, you made alot of soup, bangles are fantastic and lampwork is great too, I am a lamp work junkie!! Wonderful bunch of pieces. That acorn is just darling and I think you did just enough with it to really show it off. That necklace is my fav. LOL, Lori! I thought Kari was so inventive creating the Charmed Pennies, great minds think alike, right? Good luck in the drawing! What great pieces, I love the bangles, they are my favorites! Really pretty stuff. Wow! Stunning, all the way around! Especially love your incorporation of fiber with the jewels and metal! I love the long acorn necklace, so sweet, but my favourites are the bangles - what a perfect way of showing off the focals! I can see why you squealed when you received your bead soup package! It's awesome. The Acorn necklace is darling and the bangles look like so much fun to wear with the movement of the little beads and focals. I was very very blessed in my soup! Thank you so much for your kind words! What beautiful beads and designs! I love your use of sari silk!